What Is An Asperger’s Test? It’s not that there was anything wrong with the children. But something didn’t seem quite right. Their behavior was awkward? Abnormal? But who defines “normal” anyway? Dr. Asperger himself had always had trouble making friends. Some people called him “remote”. He preferred poetry to small talk. Perhaps in some way he identified with his patients. He made some notes in his book, and continued his observations. The children did not appear particularly interested in each other, nor in him. They would speak when spoken to, but seemed to struggle with the process of having a conversation. When they did decide to communicate, it was a decidedly one-sided affair. The child would go on about a particular puzzle or toy. He or she would be completely absorbed with every minute detail of the subject being discussed, yet seemed neither to notice (nor to care) that the Doctor was not at all interested in the puzzle. Dr. Asperger wasn’t really listening anyway. He was speculating; writing down everything he saw, and he was considering whether any of his fellow pediatricians had come across similar behavior in their patients. The children were certainly not stupid; in fact, some demonstrated above average intelligence in certain areas. One child was especially gifted when it came to solving math problems. The year was 1944, and at his practice in Vienna, the Austrian pediatrician Dr. Hans Asperger was the first to describe in detail the developmental disorder that now bears his name. His observations and most of his work went largely unnoticed for decades. It was not until 1981 that Asperger’s syndrome (also called Asperger’s disorder) was acknowledged as a unique psychological condition. It was Dr. Wing who reviewed Dr. Asperger’s notes and work and shed new light on the syndrome. Lorna Wing is an English doctor who has a particular and personal interest in developmental disorders. Her daughter was born autistic, and it was her published case studies during the 1980s that raised awareness about Asperger’s. She has since been active in making available information to the public about autism, Asperger’s syndrome, and related disorders. By the 1990s, Asperger’s was being diagnosed as a specific condition related to, but distinct from, autism. Generally speaking, autism is considered a more extreme pervasive developmental disorder, or PDD. Those who suffer from PDDs are slow to develop basic social and communication skills. Non-verbal communication cues that make up a large part of our daily lives are lost on many who suffer from Asperger’s syndrome. A wink, a nod, a shrug; none of these register with a person living with the disorder. Direct eye contact is rare and uncomfortable. Men and women living with these conditions may be physically awkward and exhibit repetitive, compulsive behaviors. They can barely tolerate changes to their schedules, and can make cleaning or dressing into an essential ritual. In extreme circumstances, they may pull at their hair, continually wring their hands or tear at their fingernails. Some people who suffer from PDDs never manage to overcome these difficulties. In certain individuals their conditions worsen over time. Without therapy and treatment they can become completely withdrawn and unresponsive to the people around them. Those who are autistic are particularly at risk. However, those who live amongst us with Asperger’s are less likely to exhibit extreme behavior. If an early diagnosis of their condition is made and the people around them understand the syndrome, they have an excellent chance of remaining a productive and participatory member of their community. One quality that does seem beyond the scope of many who live with Asperger’s and other PDDs is empathy. Many with developmental disorders are unable to take an outsiders perspective; to step into another person’s shoes and see something from their side. To a person with Asperger’s, often the only perspective that they can comprehend (and care about) is their own. Some experts suggest that those born with Asperger’s are more like “high functioning” autistic people. They are not developmentally disadvantaged, but developmentally “different”. What they lack in social skills, they may more than make up for with particular, highly specialized talents. Music is one area where those who have Asperger’s may demonstrate incredible talent, often at an early age. 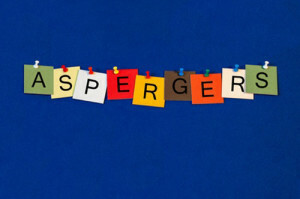 People born with Asperger’s disorder may remain undiagnosed for several years. As babies they may be irritable, and perhaps a little slower to crawl and walk on their own. As toddlers, they appear somewhat clumsy, and lack physical coordination at the playground. Motor skills may be slower to develop than their peers. Unless their behavior is extreme, most parents will dismiss early signs of developmental disorders in their child. It’s not until they begin having difficulty at school that a specialist is consulted. In certain circumstances, a child may be mistakenly diagnosed with attention deficit and hyperactivity disorder (ADHD). Individuals who have one of either of these two conditions are likely to have difficulty socializing and may exhibit “inappropriate” behaviors. Both groups may be introverted, and ignore other people and subjects that do not interest them. A major difference however, is that ADHD patients often have difficulty focusing on one thing for any period of time. They are incapable of sustained concentration, and can become frustrated when made to sit and finish a task. Individuals with Asperger’s disorder are highly selective when it comes to focusing their attention. But once they apply themselves to a task well-suited to their particular talents, they are often far more productive than their peers. We are still in the early stages of understanding Aspergers, autism and other pervasive developmental disorders. So it is understandable that opinions differ over who we consider to have a disability or disorder, and who is simply different. People living with Asperger’s often find that their condition can be managed by avoiding situations or stimulus that makes them uncomfortable. By taking the time to find an occupation where they can fully apply themselves, they turn their “disability” into a tool that builds their inner confidence and strength. So, what help is there for those of us married to men with Asberbergs? I just found out that this is a possibility for my spouse of 20 years. It certainly would explain the tumultuous life we have led. We are currently in marriage counselling and after just two sessions, my therapist suggested this as being my spouses condition and after doing my own research I have found this to be highly likely. I will pursue and MRI of his brain to be sure and also he will be taking some tests. Other than that, as far as I am concerned, I am going to try to follow the suggestions of my therapist as to how to treat him, in a way that may get only positive responses but I myself will remain at an emotional loss as I have for these 20 years.. and my children as well. He is a good man and we will try to work through this. If it is impossible for me to live without the emotional connection I need with him, at least he will be on a road to recovery for himself and that is very important also. Best of luck to you and your spouse. there IS an emotional connection, very strong, just can’t see it like in other relationships! I have a son with as, he is a very special person, all people with as are, there is no evil bone in their bodies, there is no deceit, just pure and unconditional love! Read as much as you can, it will help you understand and once things make more sense to you, you will realize that you are lucky to have found him! Be grateful your husband doesn’t have something worse. My grandson has been putting Lego meant for 11/12 year olds together since he was 3. He started reading Harry Potter books aged 6. His room is always tidy and everything has to be put in the right order. Food has to be put on separate plates some foods must not touch each other. My husband sipped some of his drink through a straw we had to replace it as he was afraid my husbands spit would be in the drink. We once deviated from a route home from nursery school and he had a huge screaming fit to go his way. My husband refused and he screamed all the way home (which was rather embarrassing) but we would not give in to him he was aged 4 at the time. He finds it difficult to sit at a table to eat and would rather stand on his chair or sometimes on the table. He is never rude or cheeky to us and does as he is told when asked. Does he have a spot of aspergers. He will be 8 in March. We all adore him. I also believe my husband has AS. We have been married 27 years and we have 3 children I am a RNC.OB. My professional and personal life involves a great empathy. My father passed away 2 years ago. My husband wouldn’t or couldn’t help me with my grief. This has destroyed our marriage. His only explanation is I didn’t perform sexually right before and after my Dad passed away. I believe this puts him into self centered catagory. He is ritualistic. He makes a dinner plan for every day on Sunday. This list is exactly the same every week. Any thoughts??. We have agreed to wait to divorce until 2018 when our youngest graduates HS. And here I thought my step son was just stupid. I had no idea what Asperger was until I met my husband 7yrs ago, I couldn’t understand why he showed lack of feeling towards me and others. It seemed that most people found him anti social and rude. Our relationship has suffered so much, that I now have been diagnose with clinical depression. I love him, but I can not see myself with him another 7 years. I have no friends outside our Church friends. Because he feels that our secular friends are not a good influence on me. I feel so helpless and unhappy. I’m not young nor is he. Any suggestions would help. A BIG thanks to Dr. Asperger for developing this syndrome as a unique syndrome. I’m sure that I have autistic traits in me, as I have got 39. I will get to diagnosed soon. For those with Asperger's, how "functional" do you feel in your life? Copyright © 2014 Aspergers Quiz .com, All Rights Reserved.